3:04pm: The Cubs have now announced the Barnette signing. 2:40pm: The Cubs and right-handed reliever Tony Barnette have agreed to a one-year contract with a club option for the 2020 season, reports Mark Gonzales of the Chicago Tribune (Twitter links). Barnette will receive a $750K salary for the 2019 season and has a club option valued at $3MM for a second season, per Gonzales. Barnette is represented by Wasserman. Additionally, Gonzales tweets that lefty Ian Clarkin cleared waivers and been assigned outright to Triple-A Iowa. That move wasn’t made to accommodate the addition of Barnette, though, as the Cubs already had a spot open on the 40-man roster. 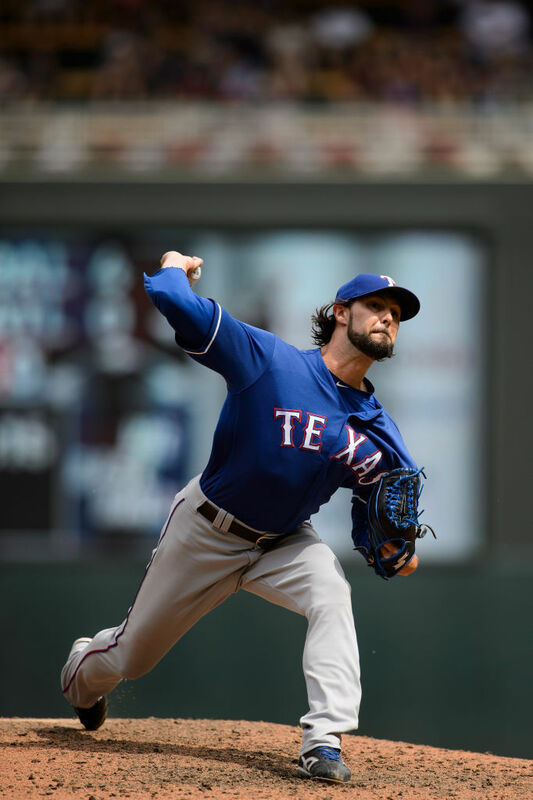 Barnette, 35, pitched brilliantly for the Rangers in 2018 but had his season truncated by shoulder issues. The right-hander logged a 2.39 ERA with 8.9 K/9, 1.7 BB/9, 0.68 HR/9 and a 51.4 percent ground-ball rate in 26 1/3 innings but made his final appearance on July 3. That season wrapped up an uneven three-year stint with the Rangers organization for Barnette, whose track record is among the more unique in today’s game. A 10th-round selection of the Diamondbacks in 2006, Barnette spent four years toiling in the Diamondbacks’ system before accepting an offer to go pitch for the Yakult Swallows of Japan’s Nippon Professional Baseball. That initial one-year offer was parlayed into a six-year run with Yakult, where Barnette emerged as one of the top closers in Japan. He saved 97 games there after ascending to that role and pitched to a 1.29 ERA in his final season there before signing a big league deal with the Rangers. The righty justified the hype surrounding him with a 2.09 ERA in 60 1/3 innings during his rookie season, but he was clobbered for a 5.49 ERA a year later in 2017 as he also dealt with finger injuries. In all, Barnette comes to the Cubs with a long track record of success in Asia and a 3.50 ERA with a 132-to-43 K/BB ratio in 144 Major League innings — all with Texas. The Cubs’ budgetary constraints this offseason are well known, as the team had to trade Drew Smyly and his $7MM salary to the Rangers simply to pick up their option on Cole Hamels. Since that time, the team’s only expenditures have been small deals for utility infielder Daniel Descalso, right-hander Brad Brach and now Barnette. While the limitations are an understandable point of contention for fans who’d hoped to see ownership support a run at a franchise-altering talent like Bryce Harper, the front office has seemingly done well in adding a pair of potentially useful setup men (Brach and Barnette) for a combined total south of $6MM. As for Clarkin, he’s a former first-round pick (No. 33 by the Yankees in 2013) that has bounced back and forth via waivers between the Cubs and White Sox on multiple occasions this winter. Clarkin was hit hard in 68 innings of Double-A ball last year, turning in a 4.98 ERA with nearly as many walks (4.1 BB/9) as strikeouts (4.6 K/9), and he’ll now stick with his new organization and likely head to Major League Spring Training as a non-roster invitee.